Everyone knows that seasonal allergies are painful and uncomfortable causing runny nose, sneezing, sinus pain, fatigue, watery eyes, and other debilitating symptoms. Allergies also effect your productivity at work and school and may be linked to depression, insomnia, and anxiety. Acupuncture offers an effective drug free treatment so you can smell the flowers. Acupuncture is different than taking a pill. Acupuncture helps to reduce pain and inflammation. But rather than adding a medication that will temporarily block a receptor, histamine in the case of allergies, acupuncture works to regulate the body’s functioning. The goals is for long term improvement from the acupuncture treatment. Qi (pronounced chee) is the body’s vital energy, it gives you the power to work, study, exercise, and fight illness. In acupuncture, the cause of allergies is often a qi imbalance. There are two major qi imbalances. The most common one for allergies is when there is too little qi, we call this a qi vacuity. When your qi is vacuous, you feel tired, can get colds easily, may have poor digestion, coughing, wheezing, and possibly asthma. 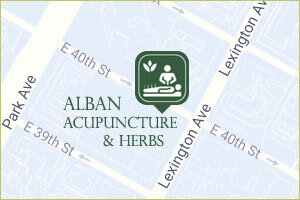 The acupuncture and herbs work to boost up your qi, giving you more energy and protecting you from allergies. What’s an acupuncture treatment like? Because the body is connected by acupuncture channels, also called acupuncture meridians, acupuncturist do not always have to treat where you are feeling the symptoms. Most often the acupuncture points I use will be below the knees and from the elbows to the tips of the fingers. Acupuncture works to correct imbalances in the body. Chinese medicine views health as a state of balance inside the body, but also between the body and the environment. This make sense for allergies, allergens in the environment are irritating the body causing imbalances. By removing the imbalance, the acupuncture allows the body to heal itself, clearing inflammation and reducing allergy symptoms. The acupuncture points will be chosen according to your specific symptoms and the imbalances that are causing your symptoms. This is why we ask a lot of questions, take your pulse, look at your tongue, and press many acupuncture points to find the specific imbalance causing the allergies. If there is lack of circulation in the lung channel, we may choose Lung 6 on the forearm. But if there is a lot of inflammation we may choose lung 5 to get rid of the heat. This is often paired with Large Intestine 4 on the hand to relieve congestion in the sinuses. Stomach 36 at the knee can be helpful as well to relieve the congestion in the sinuses, but if there is a lot of phlegm I may also do Stomach 40 on the lower leg. For people with hay fever and sinus symptoms like sneezing, runny nose, and sinus headache the overall most effective formulas is called Bi Min Gan Wan, the nasal congestion formula. This is a mild formula that helps to reduce headache, nasal congestion. This article is for educational purposes only does not serve as medical advice. Please consult a Chinese Medicine Practitioner before taking Chinese herbs. In Chinese medicine, itchy eyes from allergies is generally from heat. The herbal formula best for itchy eyes form heat is Sang Ye Tang. This formula has mulberry leaf and chrysanthemum flowers that help to relieve itchy eyes. Another effective formula for itchy eyes is called Qi Ju Di Huang Tang, which has gou qi zi and ju hua that stop eye itching. Because allergies and asthma are so closely connected, allergies can trigger asthma attacks, those with asthma often need different herbal formulas. Sometimes there is too little qi. In this case, formulas like Jade Wind Screen works to boost qi and release external wind. Also, the mushroom Cordyceps or Reishi is helpful to boost the qi.